Theatre Night: We had another trip to the Salon Varietes theatre in Fuengirola to watch their version of the popular book and film Kes. 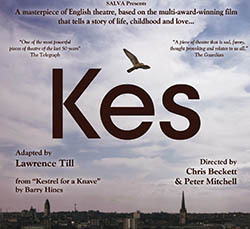 We were a little apprehensive as we recalled that it was a ‘dark’ play about a young boy from a poor home who had a Kestrel as a pet, who was his only friend. We were so glad we went to see it though, as it was a fabulous interpretation with the young boy Ben playing Billy Casper perfectly. Yes, it was sad and emotional, but it was well cast and well-acted throughout, and was an enjoyable night out at the theatre. 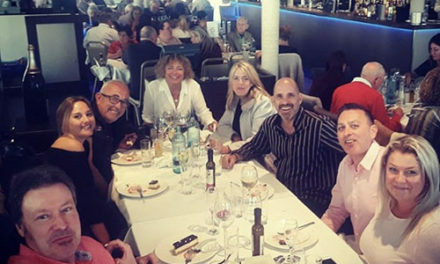 It Wasn’t Me: Our next night out was a fun evening of Murder Mystery arranged by Marbella Buddies for a friend’s birthday at a local venue in Estepona. I had been assigned a role as a bitter and slightly perverted nerd, something that I oddly found very easy to play (no sniggering in the back-row please!) There were about twenty people involved, all of whom took it seriously and dressed up in full fancy dress for their allocated characters. Hannah put together an exceptional outfit as she was playing Inspector Gadget. It was amazing what she managed to do with a pair of rubber gloves! 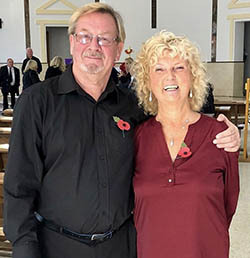 Remembrance Sunday: It really was one we will remember for a long time because we headed inland to Coin to a local church service where Hannah’s parents were performing as part of the Tapas Choir. They sang some heart-warming songs that went down well with the congregation. It was a great way to remember and pay respects to all of those people that lost their lives during the World Wars and the current conflicts. There was a bell from the Titanic in the church which was sounded to the name of loved ones that had fallen in any of the conflicts who were family or friends of people present in the service. It was really moving. 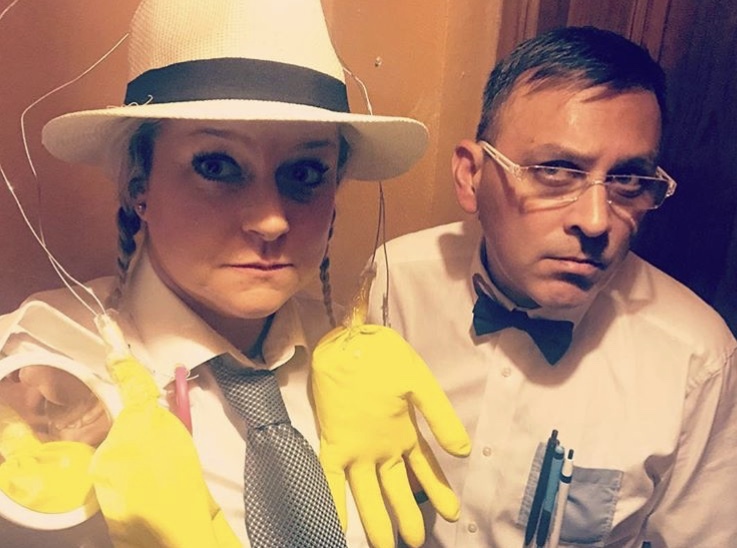 Christmas on Trial: As you might have read during previous posts, Hannah’s parents are vegan, so I have lots of fun trying out different recipes for them. We are hosting Christmas this year and I was determined to make a ‘nut’ style roast, but with a twist. 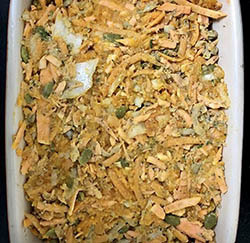 Having recently made some lovely sweet potato rostis, I decided to try grating lots of sweet potato, pumpkin and carrot and then finely grinding some fresh rosemary and stirring it in to the mixture with salt, pepper and lots of different seeds and chopped nuts. This was then roasted in the oven for 30 to 45 minutes and served with roast potatoes, vegetables and vegan gravy. The result was perfect and is going to be this year’s ‘nut roast’ for Christmas. The ground rosemary gave it that perfect ‘Sunday roast’ flavour. 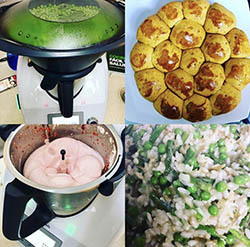 Mixing It Up: Recently when I attended the cooking course with Steven Saunders of the Little Geranium, I saw how he made use of a Thermomix. Hannah’s colleague at the radio station has a daughter who is an agent of Thermomix in San Pedro and she had asked us on a previous occasion if we wanted to have one on trial for a couple of weeks. Having seen it in action we accepted and had a demonstration evening. We made a three-course meal in just over an hour, including making, proving and baking bread. We were amazed at all the different things it can do, from chopping and grating to sautéing and steaming. The dishes that we made that night were sun dried tomato bread, avocado and lime mayonnaise, asparagus and pea risotto, and berry foam. Since then we have made many great dishes including, fresh pasta dough (in 2 minutes), pizza dough, lentil curry, cauliflower mash and steamed salmon. It is going to be really hard giving the machine back, although we have agreed to be demonstrators until February for anyone that is interested in possibly buying one. 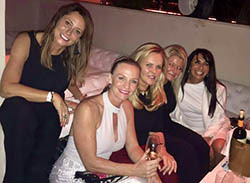 Charity Night at KAH: Hannah attended a well-publicised charity evening organised by Marbella with Love and Collective Calling at the recently opened and very plush KAH in Aloha, Nueva Andalucia. For not an insignificant fee the deal was that there would be canapes and cava all night for guests, with the money going to the charity. However, many people didn’t even get a welcome cava, with the venue stopping serving it totally, saying that it was not what was agreed! The charity was of course very embarrassed at the decision made by KAH, and many people left the evening with a bad taste in their mouths (and it wasn’t from the cava, clearly). Such a shame as it really is a stunning venue. 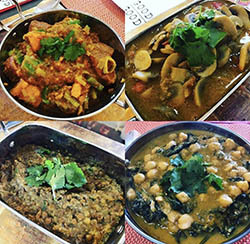 Vegan Curry Experience: As I mentioned earlier, I love to experiment with vegan food and recipes and one of the easiest things to cook with no meat is curry. With Hannah’s help in making a tarka dal in the Thermomix, I made a sweet potato sag aloo, mushroom bhaji, and chana masala for Hannah’s parents and our friends. It really is fun trying out different recipes and flavours for vegan food and although we are not vegan or vegetarian, we are finding ourselves eating far less meat and rarely cook it at home these days.